This post is sponsored by the National Watermelon Promotion Board. Ummm hello, watermelon? I think so! Watermelon is one of my favourite fruits, not only is it super scrumptious and juicy, but it is jam packed full of nutrition as well. Can we just take a look at the adorableness of these little guys? I mean really. I love little candies, but as a vegan not all candies are vegan. Read the ingredients and a lot of them contain gelatin. Bleh. So I decided it was time to create some of my own vegan homemade treats. 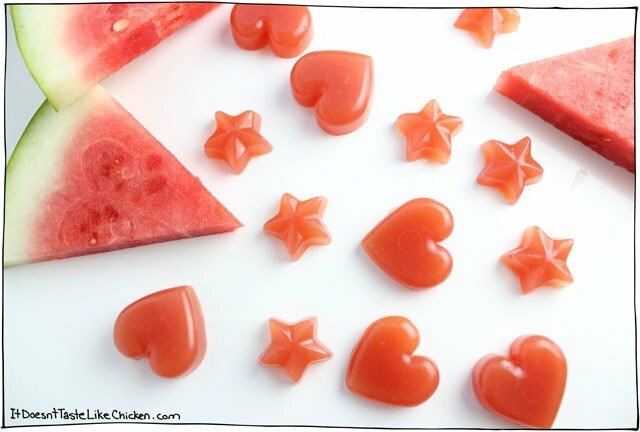 Just 4 ingredients, and I made these lightly sweet watermelon bites. How cute are they? Ok, I’ll stop talking about their cuteness… maybe. Vegans (as you might be aware) don’t eat gelatin because it’s made from animal bones. Luckily for us, there seems to be a vegan version of almost everything in this world! 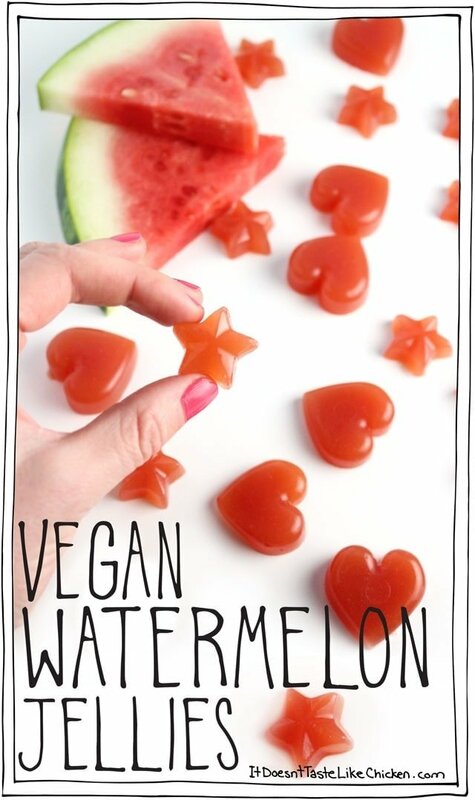 What’s the vegan version of gelatin? Agar! Agar (sometimes called agar-agar), is made from seaweed. You probably won’t be able to find at your local grocery store, boo, but you should be able to get it at a health food store, or online here. 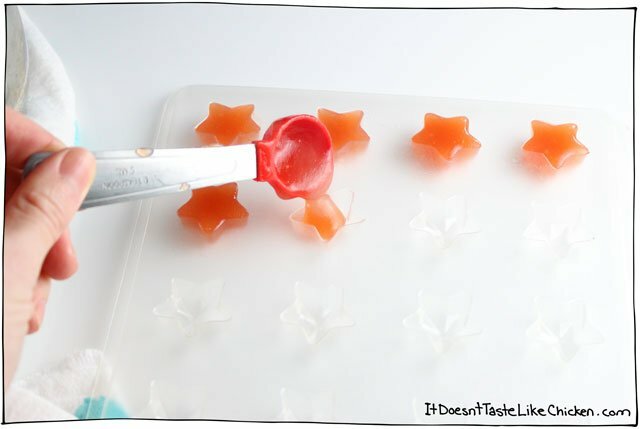 You can make the jellies into any shape you like. 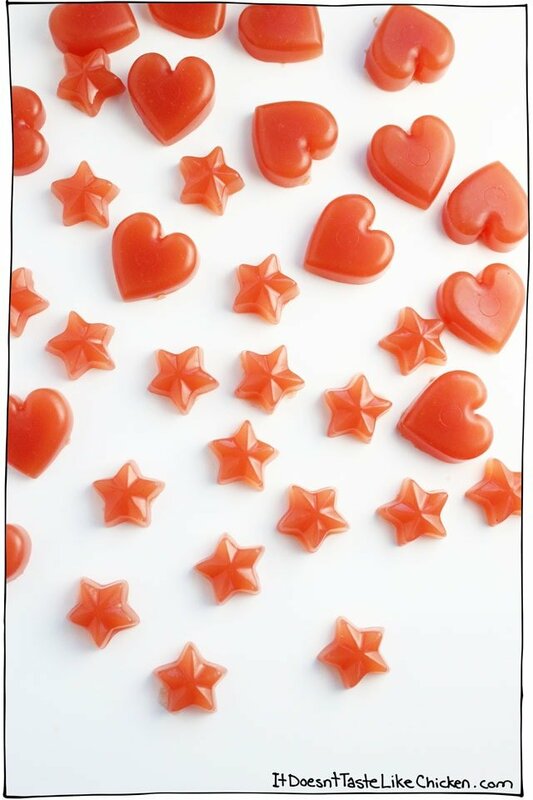 I used a star and heart shape mold I had, but you can choose from a ton of shapes and sizes online here. Christmas, Easter, Thanksgiving, Back to School, Star Wars, you name it! I find the silicone molds are a little easier to work with than the firmer plastic molds, because the candies are easier to pop out at the end. Now lets get to candy making! 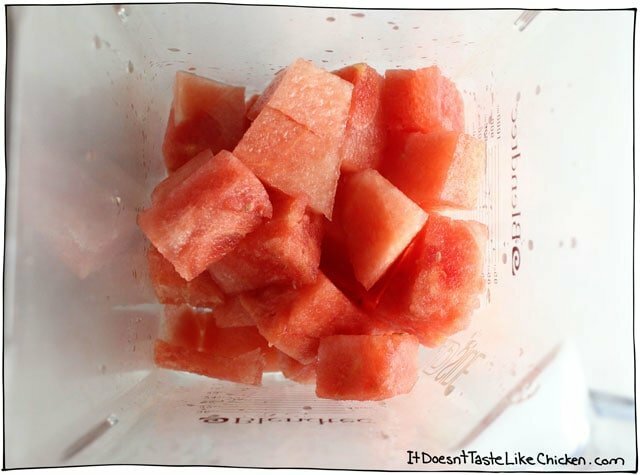 Cut up your watermelon and add it to a blender. Blend until smooth and there are no lumps. 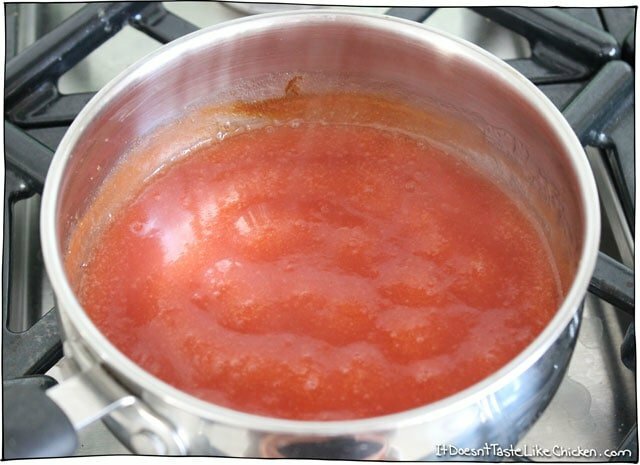 Add the watermelon juice to a sauce pan along with the sugar and agar powder. Whisk to combine. 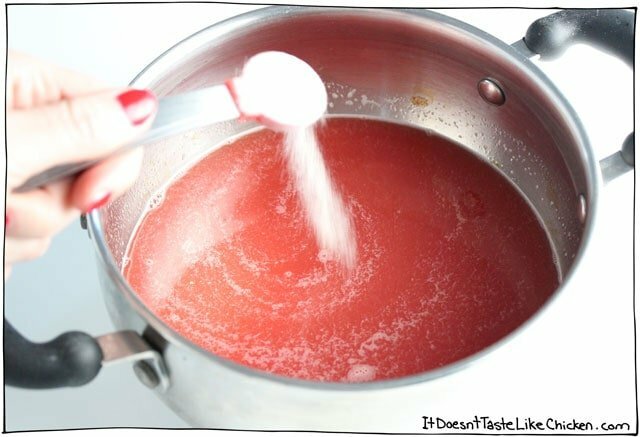 Keep whisking over medium heat until the sugar is dissolved and the watermelon mixture thickens. About 5 minutes. Remove from heat and whisk in the vanilla extract. Spoon the watermelon mixture into your mold of choice. 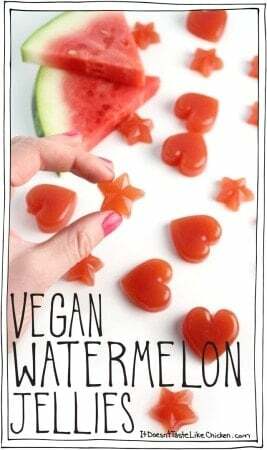 If the watermelon mixture starts firming up before you are done pouring it into the mold, just pop back on the stove for a minute, whisking while it heats back up again. Chill the candies in the fridge for 1 to 2 hours until set. Pop them out of the mold and enjoy! Store them in an air tight container in the fridge, but I think they taste yummiest when I let them warm up to room temperature. These are lightly sweet, but if you want them sweeter, you can dust them with powdered sugar, which also makes them look all snowy and Christmas-y! 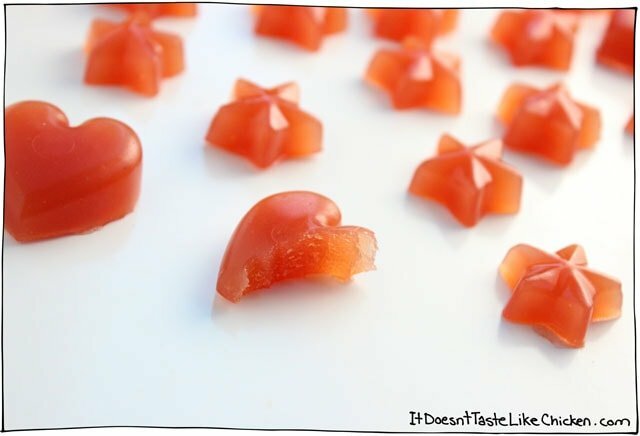 Only 4 ingredients make these lightly sweet little candies, and they're really easy to make too! 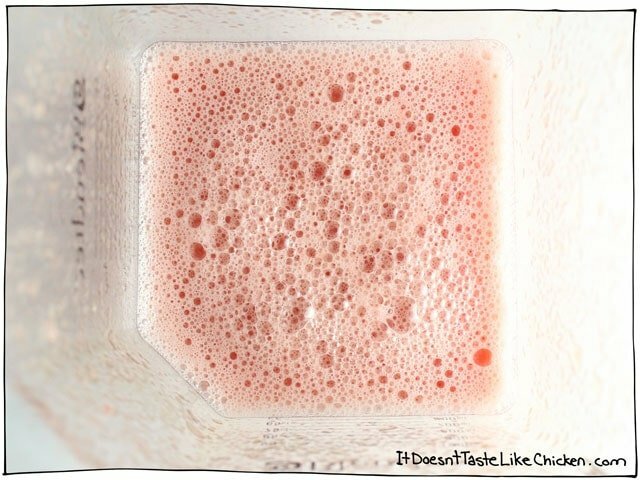 Add fresh watermelon chunks to a blender. Blend until a smooth juice consistency is reached. Measure 1 cup of the watermelon juice into a small saucepan and whisk in the sugar and agar powder. Heat over medium heat while whisking until the sugar is dissolved and the mixture thickens, about 5 minutes. Remove from heat and whisk in the vanilla extract. Spoon the mixture into molds, any shape you like! If the mixture starts to set before you are finished pouring it into the molds, return to heat, and whisk for a minute until it softens again. Let set in the fridge for 1 to 2 hours, then pop them out of the moulds. Store in an air tight container in the fridge. These are lightly sweet, but if you want them sweeter, you can dust them with powdered sugar, which also makes them look all snowy. I haven’t tried it but I am sure it would work. You might have to experiment with ratios to get the perfect flavour and texture. Enjoy! I’ve tried two other recipes before this one. One didn’t set, the other was terrible. My son loves these ones! So excited thanks! Can you make these with orange juice? Tad more sugar? I haven’t tried it myself, but I think that should work fine. Enjoy! Ummm, these look amazing! I’d definitely slip some vodka in a few…I mean I do have three kids, young kids, and mama needs treats too right?! Haha!! That sounds like an excellent plan! I’m in! If I wanted to do a sugar free version would you recommend more agar powder? Or start with the same and adjust as necessary? The wheels are turning and I’m thinking of all sorts of things! Strawberries, blueberries….apples…so exciting! I would keep the agar powder the same. From my experiments, the amount of sugar I added didn’t seem to effect the texture too much. As long as you reach a thicker consistency, it should firm up nicely. You could always test just one jelly to see if it sets by popping it in the freezer. They set pretty quickly. Watermelon is pretty mild in flavour, so when I first tried it without sugar, it wasn’t super delicious, but I bet some more potent fruit like blueberries would be just great! Let me know how it turns out for you! 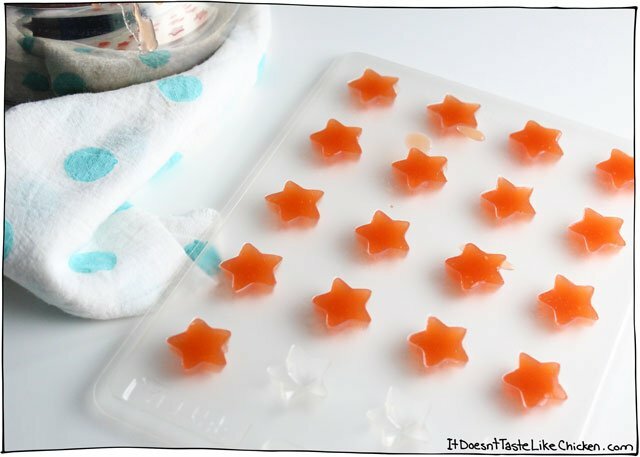 i didn’t know how simple and easy it is to make homemade jellies! I love this watermelon version! Thanks for sharing! Do you know how long they will last in the fridge? It’s still basically fresh watermelon, so I would imagine they would last as long as watermelon would last in the fridge, maybe a week? Hope that helps! I’m in th process of attemtping to make something similar using corn starch. I hope it works.